Aim of study: to examine extent of thermal spread between open and laparoscopic energised dissection with bipolar electrosurgery (Atlas and Advance – ValleyLab). Methods: Experiments were performed in 8 Large White/Landrace pigs (average wt. 27 kg), 4 of which were randomised to open and 4 to laparoscopic multi-site surgical energised dissections. Thermal imaging was performed by use of Cedip infra-red camera which was coupled to an infra-red laparoscope in animals allotted to laparoscopic dissections. All animals were sacrificed at the end of each experiment (average 1h 48mins). Results: Differences in the heat absorbance between the open and laparoscopic groups were demonstrated by the smaller fall in the rectal temperature of the laparoscopic arm (3.08C +/- s.d.0.98 vs. 1.9C +/- s.d. 0.72, p = 0.03, student’s t test). Differences were also observed in the thermal spread between the open and laparoscopic arms for: (i) vascular sealing/transection with AdvanceTM 1.74mm +/- 0.19 vs. 0.97mm +/- 0.33 respectively, p = 0.001; and (ii) esophageal sealing and transection with the same device 1.21mm +/- 0.87 vs. 1.38mm +/- 0.55, p = 0.65. Device performance degradation (increasing thermal spread during use) was significantly quicker during laparoscopic as opposed to open surgery for two devices: Atlas (Figure 1) and AdvanceTM (Figure 2). 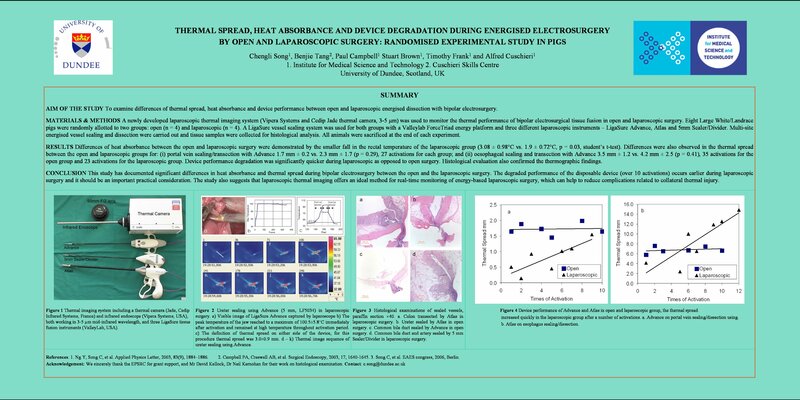 Conclusions: this study has documented significant differences in heat absorbance and thermal spread during bipolar energised electrosurgery between the open and the laparoscopic approaches. The degraded performance of the disposable device (over 10 – 12 activations) occurs earlier during laparoscopic surgery and is an important practical consideration.